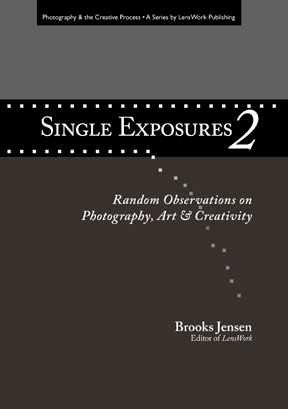 Compiled from the best of Brooks Jensen's almost-daily podcasts on photography. Between Chaos and the Predictable; The Power of Totality; Learning by Doing; The Importance of Structure; Magnet Rails, Remembering Fil;, A Harmony of Tones; Bach's Motivation; The Art Kit; Art and Decor; Photographer as Egotist; Photography and the Hurricane's Devistation; The Value of Interviewing People; 1000 Photographs; Tintypes in Print; Wright Morris; Mountains and Pixels; Now, Before it's Gone; Immersion as Composition; Tea Toning; The Obvious Made Magical; The Right Tool; The Thank-You You Deserve; Begin the Beguining; Why I Don't Mat My Own Work; Six Hundred Pounds of Equipment; Renditions, When the Art Demands Your Attention; The Date of a Print; What Inspires You? ; Workspace and Living Space; The Secondary Market; A Deluge of Graphics; Editor, Where Art Thou? ; The Power of Deadlines; The Time Frame of a Project; PDF Publishing, Graphic Layout and Design Skills; Photographing the Wind; Preservation, How Much Detail Do You Need? ; Some Old Contact Sheets; Context; Majoring in the Minors; The 60-Second Monet; The Big Combo, Making Dark; — and many, many more!